It’s such a deep poem. I feel like I have just barely scratched the surface in understanding it’s meaning. It would probably take me years to properly unpack. As you read on, you realize the poem is about fear, insecurity, comparison, procrastination, paralyzation, regret and the endless What if…? Prufrock seems to be chronically insecure, obsessed with and afraid of what others think of him. Thus, he talks himself out of taking any kind of risks by saying he already knows what the outcome will be or he procrastinates saying that he still has time. In the end he is left completely alone, wondering what might have been, and still as insecure as ever. Aside from T. S. Eliot’s splendid word usage and vivid imagery, what keeps me coming back to this poem is its profoundness and ambiguousness. I could probably read it a thousand times and still find some new meaning or way of interpreting it. 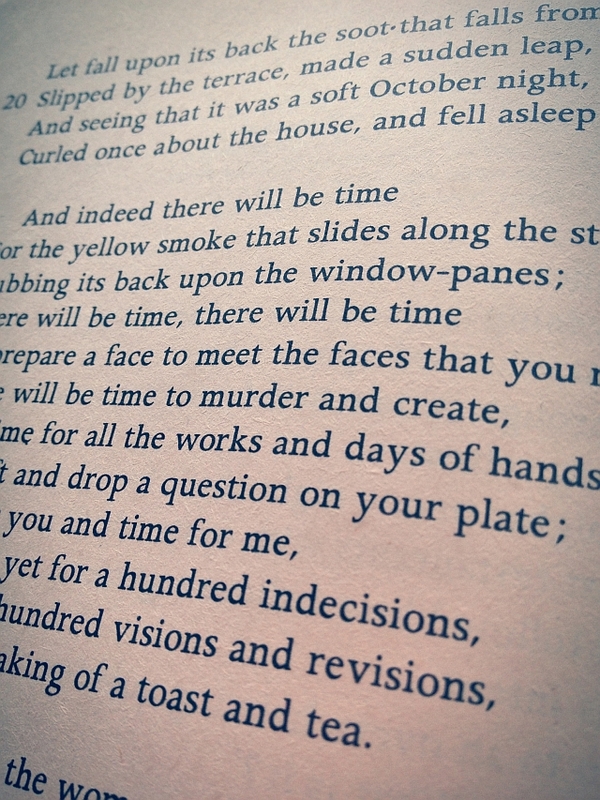 That, and the fact that there are times that I see myself in Prufrock. 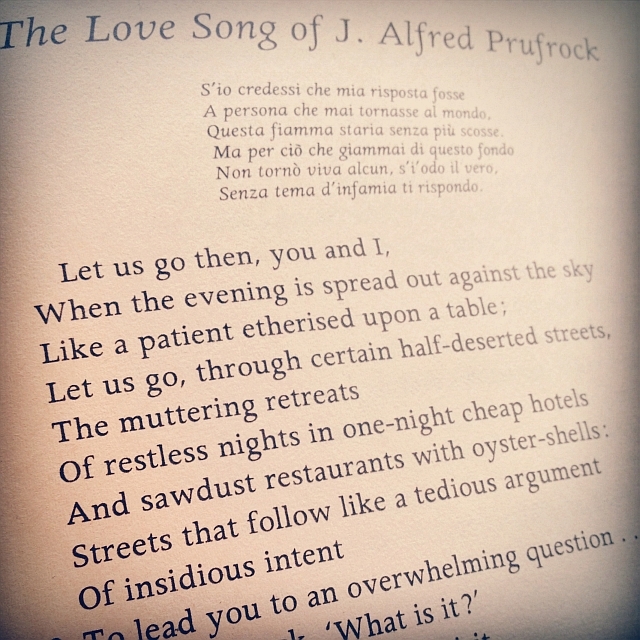 In fact, I think there is a little bit of Prufrock in all of us. There are times we all wonder, Do I dare? And times that doing something as simple as walking up some stairs to talk to someone can feel like taking a HUGE risk, possibly along the same scope as “disturbing the universe”. And then the times we don’t take those risks we wonder, Would it have been worth it, after all? or we rationalize, and talk ourselves out of it, or tell ourselves we knew what the outcome would be and it was for the best that we didn’t act. “Prufrock” paints a picture of what happens when fear–in its many forms–dictates your life. It leaves you paralyzed. Yeah, I think, “I have measured out my life with coffee spoons” definitely resonates with coffee lovers/addicts…heh. It was one of the phrases I liked the most when I first read it. Now there are so many others that I like just as much or even more.